I was honored to be selected to present at this year’s VCA conference in Williamsburg, VA. This was my second experience presenting at this conference. 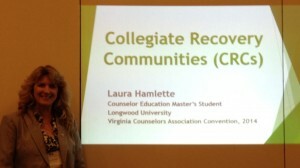 Last year, I had the privilege to present with Dr. Kevin Doyle on Collegiate Recovery Communities (CRCs). I felt very proud that he trusted me to go it alone this year. 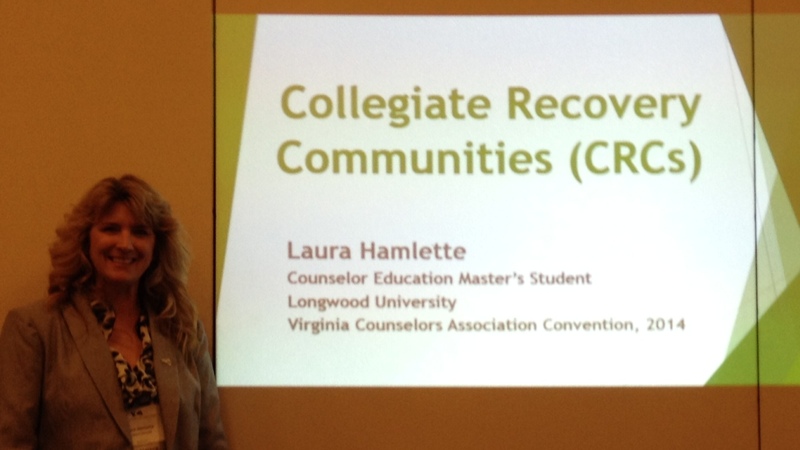 I believe the information I had to share about CRCs is important and am proud that Longwood is home to one. “Longwood Recovers” was established in 2013 and provides a great network of support for those in or considering recovery from substance use disorders or other problematic/addictive behaviors. I enjoyed attending the conference this year and getting together with fellow Longwood members and alumni. I am grateful to Longwood and Dr. Doyle for supporting me and efforts to get this message out there. I am so proud to be a Longwood girl! Thanks for the continued opportunities! This entry was posted by Laura Hamlette on December 8, 2014 at 3:32 pm, and is filed under 2014-2015, Counselor Education. Follow any responses to this post through RSS 2.0. Both comments and pings are currently closed.